Mission Statement « Rescue K911 is an animal shelter located in Camp Hill, AL. Rescue k911 is a non-profit, no-kill organization dedicated to reducing overpopulation, abuse and neglect of domestic animals. Rescue K911 is run entirely by compassionate like-minded professionals who volunteer their time and resources to help save the lives and then care for these animals. Since 1997, we have successfully placed over 1,000 animals in loving homes. Promoting spay and neutering to end the suffering of overpopulation and unwanted animals. Adoption of healthy animals back into loving homes. Build and erect a building (Shadow’s Rest) for our elderly, handicapped and special needs dogs where they can be safely and more comfortably sheltered until adoptive homes can be found. Rescue K911 sits across a 7 acre site in Camp Hill Alabama where we not only provide necessities such as food, shelter and medical care for our rescued dogs, but also the loving arms of people who genuinely care about these animals. On any given day you may find between 100-120 rescued dogs of all ages, sizes and breeds. We actively search out suitable homes for these dogs, by listing them on our website and petfinder.com. Our screening process includes an in depth application, reference checks, and a home visit to ensure the home and family is compatible with the pets’ needs and our requirements. We ask adoptive owners to sign a detailed contract obliging them to give the animals a loving home. According to The Humane Society of the United States four million cats and dogs – about one every eight seconds – are put down in the U.S. Many of these animals are happy, healthy, adoptable pets that are needlessly euthanized because of the simple fact that they don’t have a home. Rescue K911 works tirelessly to decrease this overwhelming statistic. Rescue K911 is run entirely by volunteers who are dedicated to helping the homeless dogs. We do not receive any government funding only by support and donations from private individuals and local companies who care and want to support us with our mission to help the homeless. Based on our thirteen years of experience housing rescued dogs it is estimated that the yearly cost for caring for a dog is $1,500. This cost includes food, veterinary exams, spay/neuter/ vaccinations, and heart worm and flea treatments. This represents an average annual cost to Rescue K911 of over $180,000. We need your support! 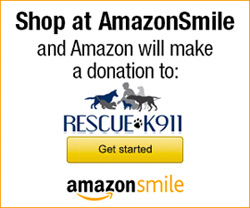 We thank you for coming to visit our website and for your interest in Rescue K911. Thank you for helping the homeless and spay and neuter your pets!